All in-studio workshops (Gainesville, VA) have openings for 10 participants. At least four participants are needed to run the workshop. Please feel free to call for details about workshops, pricing, dates and times. Workshops can be designed as requested. Please feel free to ask about workshops you’d like to see offered at my studio, in your home or at a school. Do you home-school? Inquire about classes you’d like to have your child attend during the day. Pricing includes materials unless otherwise specified. More unique and interesting workshops are always in the works! Tutoring services are also available throughout the year. Ask for more information. Let's see what we can make using natural resources like shells, rocks, flowers, sticks and leaves. 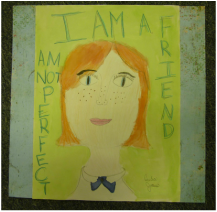 Learn and do projects about the world's most famous artists. Artist studies may include Mondrian, Matisse, Monet, Van Gogh, Cornell, O'Keeffe, da Vinci, and more. Kids should have the chance to have fabulous art experiences more often! My goal for this workshop is for the children to have lots of fun, use materials that perhaps they have not tried and come away with pieces and projects that may be very different than those they have made at school. Through the story of The Wizard of Oz, the children will identify several positive character traits. We will have interactive discussions and do fun projects relating to these traits. Fun with theater games, improvisation, miming, creating characters, props, music, masks and puppets! Each person gets a big fabric-covered blank journal with no lines. Art journaling is using words and images in response to prompts given to you--about you! Each page ends up a work of art. No art experience required! We will be combining text with painting, collaging, etc. If you like art and you like words, you are sure to like this class. Then you take home the journal and you can continue it. Bring it back more times for more classes. We’ll explore children’s books from classics to recently published. Through these wonderful picture books, we’ll discover and discuss core values including respect, kindness, courage, responsibility, love, perseverance, tolerance and honesty. We’ll enjoy read-alouds, role-playing, art projects and other fun activities as we learn about how the story characters show their good character. A different story each time. You’re a Poet-Bet You Didn’t Know it! This workshop is meant to open up the world of poetry to kids. Children’s imaginations will be sparked and they will be exposed to a variety of ways to create with words. Children will be introduced to the styles and ideas of famous artists and, using basic art concepts including line, shape, form, color and texture, will produce artwork based on those artists. In a world where we HAVE to use our left brain most often, where words HAVE to be spelled a certain way and 5 + 5 HAS to equal 10, my goal is to keep our right brain in play as well. Kids need as many opportunities as they can get to be creative. 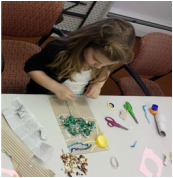 Kids will explore hands-on projects and activities based on art, words, music and games--all in the name of fun, self-expression and creativity! The children will learn about different kinds of puppets, create a variety of puppets and have fun putting on puppet shows. We believe in fairies! Fairies are delightful magical spirits with likenesses and kinship to flowers, insects and other small creatures. Fairies are not only cute...they are problem-solvers, helpers, fixers and protectors of nature. We will make fairy crafts, eat fairy treats, hear fairy stories and poems and create a fairy house with materials from nature. Fun ways to review the basics of reading comprehension, English, spelling, paragraph and essay writing, and math. Brush up over the summer! A season worth celebrating! We'll do projects and activities using flowers, fabric batik, shadow sculptures and lots more. We'll draw outside and enjoy snacks that go with our theme. Part art workshop/part Halloween party! Lots of fun activities including Halloweeny art projects and crafts, Halloweeny snacks and an awesome Halloweeny goody bag to take home! We'll enjoy fun stories, discussions and crafts all about the virtue of living a life of gratitude. Just in time for Thanksgiving! We will be talking about the joy of giving and then making wonderful ornaments worthy of gift-giving. We will also make gifts to give to those in need. Children will create homemade valentines to give out to friends and family. Homemade is always better than store-bought! The kids will have fun making their Valentine's Day creations, learn art tips along the way, have a themed treat and enjoy thinking of others while they create! This is a workshop for students who have an interest in writing and want to push their work into new, creative directions in a relaxed setting. They will learn how to write poems, memoirs and short stories about topics that matter to them, their lives, who they are and who they want to become. A variety of lessons based on the work of Nancie Atwell and others will give the students a tool box from which to pull writing prompts and ideas in the future as well. This workshop will cover the basic parts of speech in memorable and fun ways. Yes, learning grammar can actually be lots of fun! Come learn the difference between an adjective and an adverb once and for all and know when to use "good" and "well" correctly! Through lessons, stories, games and activities, you'll become a "Grammar Guru!" We will read a chapter book in its entirety, chapter by chapter. This can be your child’s summer reading assignment for school or I can recommend a great level-appropriate selection for any time of the year. We will have discussions and do fun activities that aim to cement the comprehension of the story line, themes and new vocabulary.